The news cycle on the Iran nuclear story never seems to end. It is one sound bite after another. 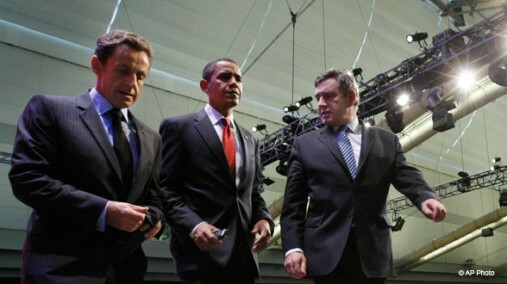 On Friday, we had to endure a pre-announcement (read drum-roll) that there would be a formal announcement by US President Barak Obama, French President Nicholas Sarkozy and British Prime Minster Gordon Brown on the existence of a secret Iranian nuclear enrichment facility under construction near Qom. This, just a day after the UN Security Council meeting where all three took a bash at Iran’s nuclear program before passing a resolution on global denuclearization. And that, following two days of relentless UN General Assembly speeches by various heads of state blasting Iran’s nuclear agenda. As the news leaked out, we learned that the US had known about this facility for years, while other news sources claimed that French, British and American officials have worked all summer on presenting a disclosure of this secret underground facility to the IAEA — the international agency that oversees and maintains compliance on the nuclear activities of member states — this week. They must have been furious to learn that Iran, of its own volition, beat them to the punch in a letter to the IAEA last Monday, alerting the agency that “a new pilot fuel enrichment plant is under construction in the country,” according to a statement released by the IAEA on Friday. “The Agency also understands from Iran that no nuclear material has been introduced into the facility,” it continued. Fact: The current rate of inspection of Iran’s nuclear facilities is an inspector’s visit every other week. It is by far the most heavily enforced inspections regime in IAEA history. Approximately half of these visits are unannounced. Per the Non-Proliferation Treaty (NPT), member states have the right to enrich uranium. Iran signed onto the treaty the year it became open for signature, in 1968, a year after the United States provided Iran with its first nuclear plant, and two years before the NPT came into force. In 2002, it became known that Iran was pursuing a nuclear enrichment program, which it acknowledged in 2003, and subsequently opened its doors to the IAEA to place these facilities under the required safeguards. To be fair, while the IAEA’s exhaustive inspections have found no evidence that the Iranians are diverting nuclear technology or materials to a weapons program, Iran has not helped its own case. It continues to be less than transparent about its activities, perhaps in part because it does not expect a fair hearing, but also undoubtedly because the impression that it may be developing nuclear weapons capability doesn’t exactly harm its deterrence position vis-a-vis regional and foreign foes. But back to the events of Friday. The endless days of orchestrated sound bites on Iran’s nuclear intentions were frankly overkill by week’s end. The indignant Security Council trio, who displayed dismay and shock at the revelation of this new enrichment facility, were surely shamed by the news that they had been sitting on this nugget of information for years, and had spent the summer secretively trying to maximize its impact on the IAEA. Surely if Iran’s nuclear enrichment program was actually the imminent threat that is so often alleged, these nations would have immediately alerted the agency responsible for safeguards and inspections? So what’s with the relentless scrutiny of Iran’s nuclear intentions? Let me go out on a limb here: Iran, which is a major oil producing state in a strategically important region, has a very independent foreign policy stance on issues that are of concern to the United States and many of its allies. They don’t like that. Israel, the US’s main regional ally, needs to keep itself relevant to Western powers now that the Cold War is well and truly over, divert attention from it’s own covert nuclear weapons stash, and avoid accountability for its failure to address the Palestinian issue. It needs a big old bogeyman. Enter Iran, the convenient scary kid on the block. Iran isn’t exactly an angel — it has powered up its anti-Israel rhetoric to stay relevant on the Arab and Muslim Street. These two blocs clash, and they seek continuously to curb the other’s influence. The bluster, threats and sound bites we have heard this past week were nothing more than an effort to create maximum pressure on Iran as the October 1 meeting between the Islamic Republic and the group of five permanent Security Council members plus Germany draws near — a meeting where the group of Western nations hopes to secure compromises on Iran’s nuclear program. It was political posturing in technicolor — live footage beamed to millions of TV screens across the globe — using the annual UN General Assembly Plenary Session as a stage, and counting on the thousands of gathered reporters as the playwrights of this unfolding drama. When Iran sits down with the US to discuss nuclear and other issues in October, it will not likely budge on the state’s “inalienable right” to enrich uranium for peaceful purposes. Energy independence is a vital issue of national security for any country, and Iranians are unified on this subject, particularly as the years of living under foreign sanctions regimes has left the country mistrustful about depending on imports. Iran also enjoys the support of much of the developing world on the nuclear enrichment issue, where it has taken time to build coalitions through shared visions and the offering of financial and humanitarian assistance. And talks of double-standards are playing throughout much of this bloc of nations, particularly after the United States and its Western allies voted against a September 18 IAEA resolution that called for Israel to join the NPT and subject its nuclear facilities to the same oversight as other countries. But the events of this past week have upped the ante, and the US and its allies will be hard-pressed to back down from the line in the sand drawn on Friday. So, sadly, sanctions it may be — to the detriment of common sense and constructive engagement. Memories of another misguided WMD pogrom in neighboring Iraq not too long ago are surfacing. And yet the drama continues.